Hyundai Forklift has announced that a small-frame 11,000 lb. diesel engine powered forklift truck has been UL certified and is now available to the U.S. market. The truck is in a family consisting of 35/40/45DS-7E, and the model is designated 50DA-7E. It is built on the same frame as the 45D-7E, and dimensions are similar to that model forklift (see below comparisons). As an added bonus, the cost for this truck is more in line with its’ little brothers and 20+% lower than its’ larger cousin, the 50DS-7E. 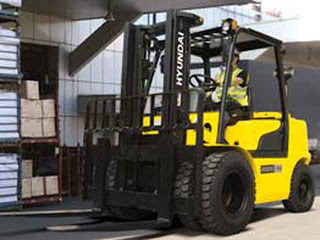 For the cost-conscious consumer, it is the ideal model forklift for their use, providing the lifting capacity that they need and excellent maneuverability in tight areas. Equipped with the Mitsubishi S6S-DT 91 HP diesel engine, it will supply all the power you will ever need in this size forklift. The 50D-7AE is available for sale immediately and prices are available by contacting your friendly Hyundai Forklift of Southern California sales team. I like forklift design is so nice.